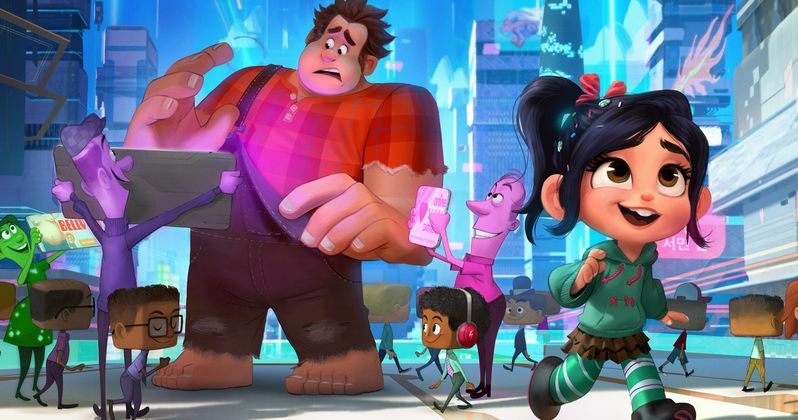 Disney has unveiled its 2018 movie preview, which includes a brand new photo from the highly-anticipated sequel Ralph Breaks the Internet: Wreck-It Ralph 2, arriving in theaters this November. This image essentially visualizes the Internet itself, featuring Ralph being bombarded with pop-up ads, while Vanellope runs off to explore another corner of the world wide web. Along with this photo, Disney has also released the official synopsis, which you can check out below. "Ralph Breaks the Internet: Wreck-It Ralph 2 leaves Litwaks' video arcade behind, venturing into the uncharted, expansive and thrilling world of the internet-which may or may not survive Ralph's wrecking. Video game bad guy Ralph (voice of John C. Reilly) and fellow misfit Vanellope von Schweetz (voice of Sarah Silverman) must risk it all by traveling to the world wide web in search of a replacement part to save Vanellope's video game, Sugar Rush. In way over their heads, Ralph and Vanellope rely on the citizens of the internet-the netizens-to help navigate their way, including a website entrepreneur named Yesss (voice of Taraji P. Henson), who is the head algorithm and the heart and soul of trend-making site Buzztube." It was also revealed at Disney's D23 Expo last summer that Wreck-It Ralph 2 will feature a number of Disney Princesses. Auli'i Cravalho (Moana), Kristen Bell (Anna in Frozen), Kelly MacDonald (Merida in Brave), Mandy Moore (Rapunzel in Tangled), Anika Noni Rose (Tiana in The Princess and the Frog), Irene Bedard (Pocahontas), Linda Larkin (Jasmine in Aladdin), Paige O'Hara (Belle in Beauty and the Beast) and Jodi Benson (Ariel in The Little Mermaid) will all reprise their iconic voice roles for what will be the largest gathering of Disney Princesses ever. The clip showed at the D23 Expo revealed Vanellope exploring the Oh My Disney website, where she comes across these princesses. While we still have almost a full year before this animated sequel hits theaters, these Disney Princesses are already thinking ahead to the future. During interviews after the D23 presentation, all of the actresses indicated that they would definitely return for a Princess team-up movie, along the same lines as Marvel's Avengers: Infinity Wars, but for animated princesses, instead of superheroes. While there is certainly no shortage of interest from the actresses, whether or not this will actually be developed into a Disney animated movie remains to be seen. If fans certainly respond to all of these Disney Princesses gathering in this movie, it's possible that it could go into development, at some point. It was also confirmed at D23 that this animated sequel will feature Star Wars and Marvel characters along with the Disney princesses, and hopefully we'll get to see some of these characters when the first trailer drops. Directed by Rich Moore (Zootopia, Wreck-It Ralph) and Phil Johnston (co-writer Wreck-It Ralph, Cedar Rapids, co-writer Zootopia), and produced by Clark Spencer (Zootopia, Wreck-It Ralph, Bolt), Ralph Breaks the Internet: Wreck-It Ralph 2 hits theaters on November 21, 2018. As of now, Ralph Breaks the Internet: Wreck-It Ralph 2 will be going up against MGM's Creed 2 and an untitled project from director Robert Zemeckis. Take a look at the new photo from Wreck-It Ralph 2 below, courtesy of Disney.